Last week was certainly an interesting one. Between Thursday’s snowstorm and no school Friday, we imagine everyone is looking forward to school tomorrow. The week is a short one - two full days and ½ day Wednesday. Thursday and Friday the district is closed for Thanksgiving break. All families should have received an email from Dr. Ficarra this weekend. It is an important time in our district as we move forward. We have copied it at the bottom of this eblast below for those who have not received it. Lastly, we wanted to take this time to say thank you to all our amazing families, students and MMS Staff. It is truly a pleasure to be a part of the MMS community. For Siblings of People with Special Needs, a free, safe space to talk to other kids who are in the same situation. Grades 5-8, drop off, snack are provided. SEPAC Nov 27, 7:30-9: The Special Education Experience: PreK and Elementary grades, as well as all newcomers to Special Education! An interactive discussion on issues of importance, including how to know what your child needs, advocate for appropriate supports and navigate transition points, will be moderated and informed by SEPAC’s knowledgeable PreK and Elementary School special education liaisons. Dr. Laura Morana, Director of Special Services, is also scheduled to participate. A dramatic presentation of kindred spirits from parallel worlds - Anne Frank and Martin Luther King Jr. at CHS on December 4. For more information and to buy tickets, please click here. At their meeting on Monday, November 19, 2018, the Board of Education will vote on the Superintendent’s recommendations for the Long Range Facilities Plan. The agenda is available here. You can attend the meeting, or watch it via livestream. Part of the plan includes expansion to meet our growing enrollment, and to replace the classrooms which will be lost when we remove the decaying portables from our elementary schools. During the development process, the District has considered a number of different possible configurations, weighing the educational benefits of each as well as the feasibility and cost given our existing buildings. We also solicited input from the community and staff during several months of interacting with the community to explain the initial plan and collect feedback at small and large meetings. The Board of Education held several sessions with the Board of School Estimate, which has the taxing authority for to discuss the plan as it was being developed as well. Extensive community feedback factored in to the Superintendent’s final recommendations to the Board, which were presented at the October 15, 2018, meeting, and discussed further at a special session on November 7, 2018. In addition to the Superintendent's recommendations for $93.1M in health and safety renovations and $38.8M for K-5/6-8/9-12 facility expansion, the Board will also be asked to vote on the options listed below at Monday's meeting. The vote is to authorize the architect to submit the projects to the Department for Education for review and approval. The Board will make a final decision to request funding for these projects at a later date after the Department of Education reviews the projects. The District expects to go out for bonding in early 2019. We have a full week ahead following a short but exciting election and teacher convention week. We wanted to thank our amazing Event chairs - Lisa Schnorr and Mel Rose - who took the time from their day on Tuesday and surprised our teachers on their Professional Development Day with the MMS HSA “Woot Woot” cart, there was even an appearance by the MMS Cougar. We are so lucky to have such dedicated and enthusiastic families at MMS. On that note, next week is the BOE meeting, if you know of a student that should be recognized please read the blurb below and make sure to tell Ms. Gronau! HSA eBlast update: Our mailing list is now complete with all families' email information as provided by the District. If you need to update your information please follow the MailChimp links below. About your Student? Each month the Board of Education recognizes students who have done something extraordinary. We would love to hear about what your student is doing and make sure recognition is given. We know there are more students to recognize, don’t be shy! If you know a student who deserves recognition - in or out of school - please contact Principal Gronau at dgronau@somsd.k12.nj.us. About MMS? We have heard from a few families and would love to hear more! Do you have a positive story about MMS or the Principal and staff? We’d love to hear them and post on our Facebook page. We are so excited with all of the terrific feedback we’ve been hearing since school started and thought it would be fun to share some of the stories with the rest of the MMS community! Please send to Deb or Sara at:debcatholt@gmail.com or szknutsen@gmail.com. November 14 - make-up photos. Please have your student bring the original photo. If you have any questions, please contact Lors Studio: www.lorsstudio.com or (908)964-3040. A film of inspiring stories from the forefront of innovation in education from the makers of Race to Nowhere. A screening of the film and discussion facilitated by Ann Bodnar, Principal, Clinton Elementary. November 15, 7:30 pm at Clinton Elementary School. Click here for more info. Thanks to everyone who has been in touch with Rachel Fisher! The MMS HSA is compiling a list of Visiting Mentors: individuals who will talk to middle school students about their work and/or how they apply math, science, language arts and fine arts skills in their professions. We are creating a list that will be available to MMS teachers so they can invite community members into their classrooms to share their stories and expertise. If your work involves math, science, language arts skills and/or the arts – or an interesting combination of these areas - and you can imagine turning that work into a lesson or speaking with middle schoolers about it, please contact us at MMSHSAinfo@gmail.com! Interested in joining the MLKA Club? Did you know MMS had a new Step Team? See Ms. Ogando in room 18. The Club meets every Thursday at 3:15pm. Click here for more info. I know you all are wondering what goes not over in the mysterious land of MMS...well here is your chance to get a little sneak peek into middle school. You will not be working in your child's class like in the elementary schools but just helping out in the library in general. Mr. Degnan needs the most help during his MMS investigates class (highlighted in blue on the schedule). This is a cool class that he teaches and would love a parent to be there to do some projects, filing, man the desk and just be an extra set of eyes and hands. He would love whatever time whenever you can give it but if you can make the MMS Investigates class time that would even be better! Just type in your name in the spot that you can volunteer. Please do not delete anyone's name that is already there. We have a short week coming up, and lots of information in this eblast. We hope you have had a great weekend and will get out to vote -- our District has an important BOE election on Tuesday. About MMS? Do you have a positive story about MMS or the Principal and staff? We’d love to hear them and post on our Facebook page. We are so excited with all of the terrific feedback we’ve been hearing since school started and thought it would be fun to share some of the stories with the rest of the MMS community! Please send to Deb or Sara at:debcatholt@gmail.com or szknutsen@gmail.com. Upcoming Family Support Group meeting, with Mr. Stoudemire & Nurse Porter, Monday, November 5th. A film of inspiring stories from the forefront of innovation in education from the makers of Race to Nowhere. 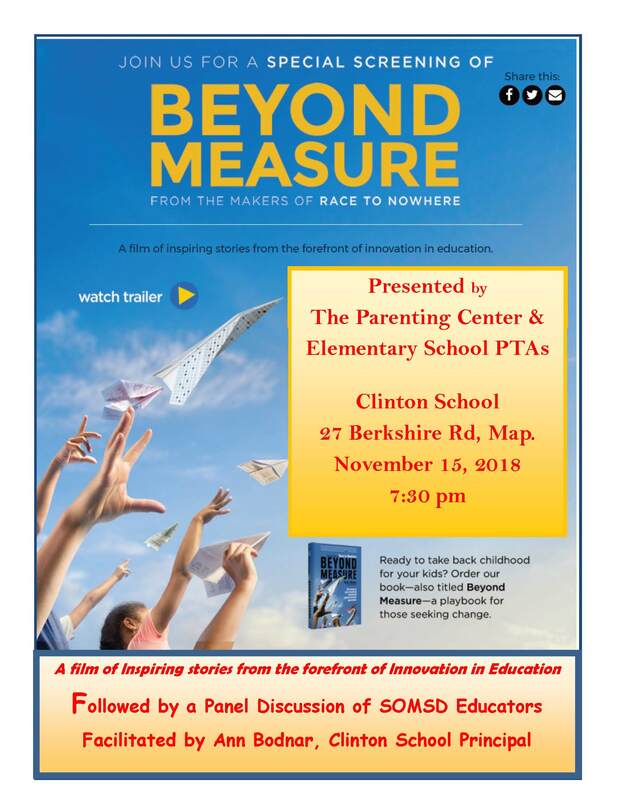 A screening of the film and discussion facilitated by Ann Bodnar, Principal, Clinton Elementary. November 15, 7:30 pm at Clinton Elementary School. Click here for more information. I know you all are wondering what goes on over in the mysterious land of MMS...well here is your chance to get a little sneak peek into middle school. You will not be working in your child's class like in the elementary schools but just helping out in the library in general. Mr. Degnan needs the most help during his MMS investigates class (highlighted in blue on the schedule). This is a cool class that he teaches and would love a parent to be there to do some projects, filing, man the desk and just be an extra set of eyes and hands. He would love whatever time whenever you can give it but if you can make the MMS Investigates class time that would even be better! Just type in your name in the spot that you can volunteer. Please do not delete anyone's name that is already there. You should have received an email from the district Friday detailing the process for the Superintendent Search. For more information please click here. MightyNest's dual mission is to help families create healthy homes AND raise money for each customer's school. Every product, including reusable lunch gear, body care, cleaning supplies, kitchenware and more, was handpicked to help families live healthy lives. To get started, simply join our school fundraiser here then choose your membership type. All members receive Free Shipping and up to 30% off hundreds of MightyNest's durable, safe products. The best part is that you will raise money for our school every month. Varsity Orchestras through the South Orange Maplewood Adult School! We are enjoying the fall weather and hope you are too! Speaking of Fall, FALL FEST IS THIS WEEKEND!!! Come to O’Reillys this Saturday night (11/3) and have fun with other MMS parents, all while supporting your MMS HSA! Enjoy delicious bar food, cash bar and fun friends. It’s sure to be a great night! Click here to order your tickets! We are also still in full outreach for our Membership Drive and No Frills Fundraiser, please consider joining and donating if you have not already. To learn more about your MMS HSA, how to get involved, or to donate,PLEASE click here! About MMS? Do you have a positive story about MMS or the Principal and staff? We’d love to hear them and post on our Facebook page. We are so excited with all of the terrific feedback we’ve been hearing since school started and thought it would be fun to share some of the stories with the rest of the MMS community! Please send to Deb or Sara at: debcatholt@gmail.com orszknutsen@gmail.com. What a wonderful fall weekend. We hope everyone had a great one. Please save the date for our Fall Fest, an Adult Night Out at O’Reilly’s on November 3rd. Join us for a low key, FUNdraiser to help support our school - and have some delicious wings while you are at it. Buy your tickets today! Click here for more info and here to buy tickets. We are also still in full outreach for our Membership Drive and No Frills Fundraiser, please consider joining and donating if you have not already. To learn more about your MMS HSA, how to get involved, or to donate, PLEASE click here! Save the date for the 6th grade canteen! $5 includes admission, slice of pizza and drink. Additional snacks available for purchase. Tickets on sale this week at lunch 10/24, 10/25/ 10/26...AND ONLINE - new this year!! Please note: Lunchtime sales are cash only - PayPal option available online HERE. Signed permission slip (paper or online) required for all students. Interested in joining the MLKA Club? Did you know MMS had a new Step Team? See Ms. Ogando in room 18. The Club meets every Thursday at 3:15pm. Click here for more info and the Club Permission slip is HERE. At this point any interested MMS students should have completed their dancing and acting auditions. We continue this week with more singing auditions and then start callbacks.